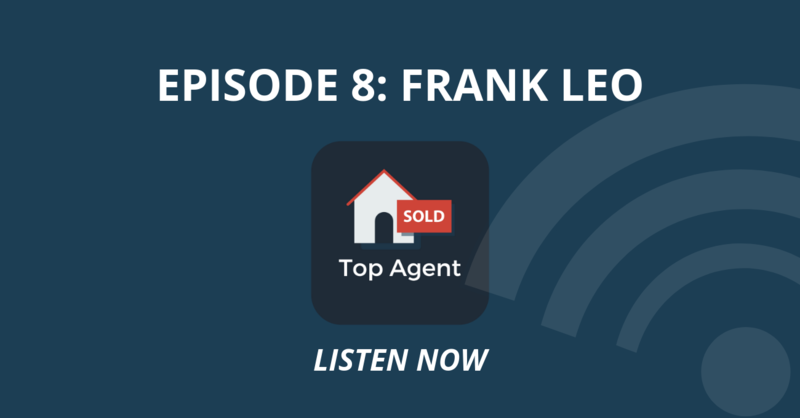 In today’s episode of Top Agent Podcast, Kosta interviews Frank Leo, a real estate giant working for RE/MAX. Frank Leo was the number one individual RE/MAX agent in the world in dollar volume for 2017, and has served the GTA area for over 30 years. Frank is such a giant in Toronto real estate, that you cannot go anywhere in the city without running into his face in an ad. Though his name is synonymous with Toronto real estate, he is a very down to earth and approachable guy. In this interview, Frank reveals that the key to his success isn’t having superhuman abilities, but rather a strong work ethic, consistency and always looking after the interests of your clients. 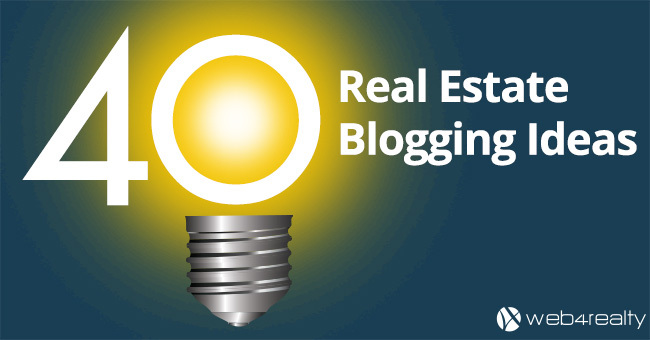 Though the real estate world is a notoriously competitive one, and at times obsessed about ranking, sales figures and numbers, Frank claims that you’ll do much better in the long run if your focus is on giving the best possible service, advice and results to the people who trust you with buying or selling a home. If you do a great job, and you surpass their expectations, your clients will become the best kind of marketing you can hope for. Whenever any of their friends and family members need any real estate services, your name will be immediately brought up. Though it’s easy to fall victim of the power of hindsight, and ask a successful real estate agent such as Frank Leo if he expected to become a household name in the industry as he is today, he claims that he had no way of knowing. 25 years is a long time, and compared to the level of technology we have today, it was basically the dark ages. Back then there was no widespread internet usage, cell phones were huge, dumb, and expensive, and a lot of real estate tools we take for granted today simply didn’t exist. The only constant in Frank’s career has been change, and he predicts that the real estate world will become a completely different beast in the next couple of decades. However, as overwhelming as constant change could be, we should strive to keep up to date with them, since they allow us to be more productive, and organized. Tools such as Google calendar, Google docs, and a huge variety of free as well as premium CRMs allows us to organize our lives, cooperate with team mates, create schedules and stick to them. However, we should also avoid becoming obsessed with emerging technologies. Frank suggests avoiding reinventing the wheel, and use common sense. When deciding the kind of marketing strategy to use, he suggests using whatever influences you the most, and whatever works right now. You definitely don’t want to miss this podcast, especially with someone as well-known as Frank. Since we don’t want to give away all the good parts of the interview, why don’t you go ahead and have a listen? It’s available by clicking this link or reading the transcript below. 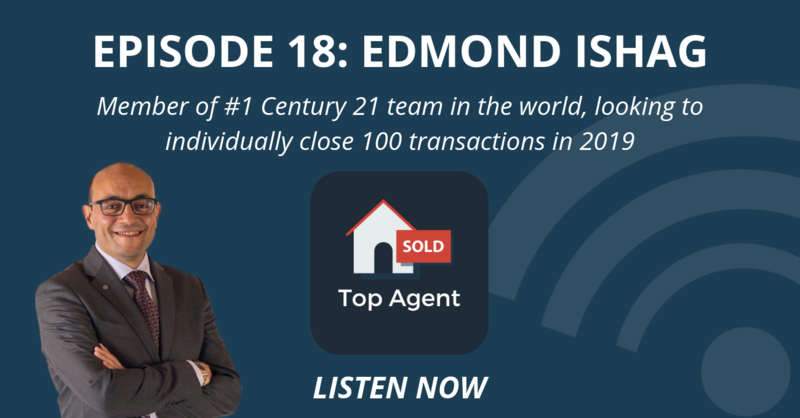 Subscribe to Top Agent Podcast on Apple, Google, and Stitcher or take a moment to read the transcript below. Kosta: My guest today is someone who doesn’t really need an introduction. 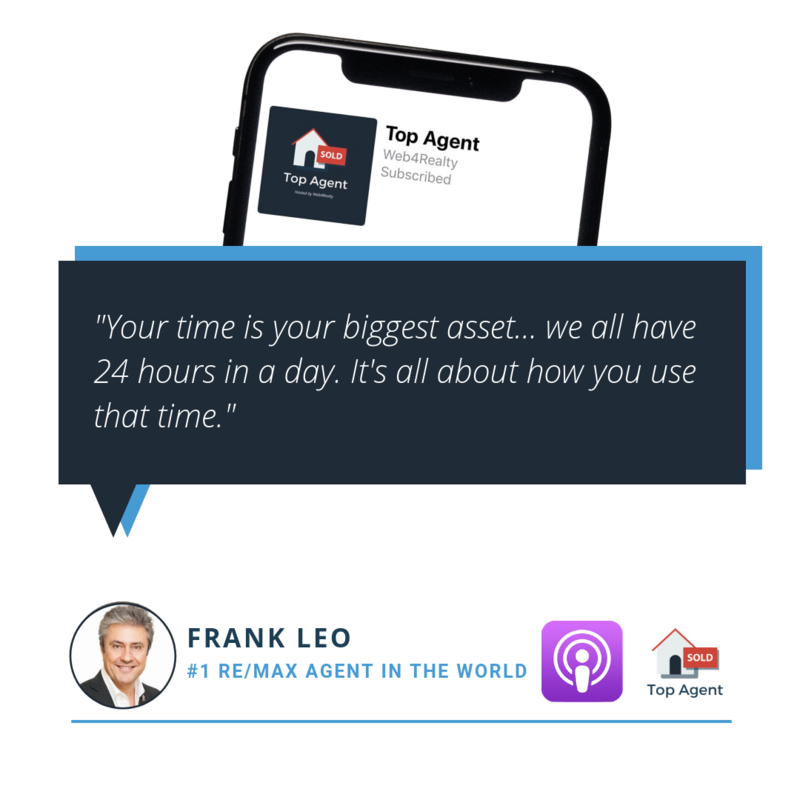 In this episode, I’m speaking with Frank Leo, the number one individual RE/MAX agent in the world in dollar volume for 2017. After knowing Frank for a few years now and speaking to him on several occasions, it’s really no surprise to me why he’s on top of the real estate game, just a top class individual, someone I have a lot of respect for. There were so many great insights in this episode. I have no doubt you’ll enjoy. There were a couple of connectivity issues on our call, so I do apologize. All right. Without further adue, here’s my chat with Frank Leo. Kosta: Frank, as you know, I was very eager and excited to have you on the podcast. So thank you so much for taking the time to speak with me. I really do appreciate it. My pleasure. Okay. So your name is pretty synonymous with Toronto real estate at this point. When you think Toronto real estate, one of the first things that come to mind is frankly. Oh, but for those who may not know who you are, can you kick things off by telling our audience a bit about yourself, your background, and how you got into real estate? Frank: Well I’m from the GTA, been in the business about 30 years. I wanted to Re/Max in terms of the company. I’ve been there for 25 years and working on building the brand and the awareness is key, I guess, and been very fortunate to, to make a good career out of it. Kosta: Perfect. So you were recently ranked then. That was a very modest intro by the way, but uh, you were recently ranked the number one individual remax agent in the world in 2017 based on dollar volume. Yes. So first off, huge congratulations on that accomplishment. Thank you. Um, what would you say is harder, the journey to get to the top or now that you’re there staying at the top? Frank: Well, I mean, anything you do that’s worthwhile. You have to put effort into it. I wouldn’t call it hard, you know, the key in life, whatever you do, not only is that you enjoy what you’re doing and that’s the key. I’m constantly looking at doing better for the business and for my clients. So as a result, you keep moving forward if someone doesn’t like what they do, whether it’s real estate or something else or not be successful. Kosta: I totally agree with that. I mean, first I think life’s too short to be doing something that you know, you’re not happy or you don’t doing. So that’s a really good point. Um, did, did you always aspire and have a goal to be that number one remax agent in the world? Or was it one of those things where you gradually saw the realization of it becoming, you know, more and more attainable as your business grew over the years? Frank: Well, you know, we’re in a very competitive business and uh, you know, you want to do better and you don’t really focus on rankings, you focus on helping more people and my goal was to help as many people as I could unfortunately, year after year to help more and more painful and as a result you get the awards that go with it, but you know, fundamentally if you stick to, you know, the focus here is really taking good care of the cloth and your best for people who are buying and selling in our industry. And if you do a good job then they’ll be happy. They’ll tell their friends, business grows and that’s what you want is you want happy clients and it’s a good life and you want to share that with everyone. Kosta: Oh yeah. There’s no doubt about that. But when you started out with remax 25 years ago, did you ever foresee yourself becoming such a household name in the industry and becoming this globally ranked realtor? Frank: Well, 25 years. His world. I mean, you can’t envision that. I mean, you know, when you go out there and you have a challenge, you will tackle it. Obviously you’ll be the best that you can be a, you don’t know where that’s going to take you. I mean, I started in the stone ages when there was no internet even, there was no fax machines weren’t invented yet, and so we had all these obstacles against us and now all these years later, we are, you know, working with technology that never existed. So how can you predict where your business is going to go if you don’t know what’s going to look like? And even then years from now, it’s going to change a guess drastically a game. Frank: you’re always moving forward and you have to, you know what, that’s, that’s passionate drive. When you lose that, it’s the beginning of the end, so you know, anyone who forced themselves to do anything, they’ll never be great. Frank: you have to organize. I mean, you know, your time is your set and you want to make sure that you, uh, uh, you know, use it wisely. And so we all have 24 hours in a day and it’s how you used your time. Um, give plenty of notice. Book it into your schedule and just follow your schedule and you know what I mean? People understand. I think, I think the world, everyone is busy now. If you talk to anyone, everyone’s always busy, but I think they may not be maximizing their time. And so as you get busier, you learn how to maximize better. Kosta: Oh yeah. One hundred percent. Or are there any tools or apps that you use to help organize your days of it better? Frank: Oh, absolutely. We have Google calendars, you know, crm calendars and I have that wonderful thing. It’s called a daily planner. Frank: The great thing is, it never runs out of battery. Kosta: I like that. How big is your team now, frank? Frank: Well, I mean I work with agents and uh, you know, is really working together on getting it done. I don’t like to say I have a team, I have partners working with me, trying to, you know, create a new standard for the industry. Um, you know, the client is, is, is our goal to make them happy. It’s a big decision. It’s a big purchase. We’ll take it lightly and their best to help them accomplish their goals. Kosta: Yeah. Amazing. That’s a great answer. As I said in the beginning, you know, your name is synonymous with Toronto real estate and I think that’s because um, you know, you alluded to a little bit, but you market yourself like crazy. You literally use every single marketing channel from bus ads, billboards, radio spots, TV commercials, you know, social media. Do you name it? You’re there. Why do you think it’s important to continually use these different mediums to promote your business? Frank: It’s at this point because I do so much and people see not just one but multiple, so they see you here. And so that’s kind of hard to navigate. But um, you know, I think the secret is not hard. If I were to ask anybody out there who wants to advertise is don’t try to reinvent the wheel. I mean you are a consumer as well as a business person. What media effects you? What makes you go into certain direction? Then advertise on that media and they’ll track like my people. Kosta: That’s true. I mean I think a good marketer is really good at understanding human behavior and just understanding where people’s attentions lie. And I think, like you said, if you cover all the basis, I think you’re. Frank: But to start with, you can’t do all the bases. I mean I’ve been doing it for a long, you know, you don’t have to go out and ask other people what they think. What do you think you’re the person will do the advertising and marketing, you know, what affects you, what helps you make your decision? Now, if you understand that you’re a person who reads the paper, well then you should advertise in the paper. If you’re a person who goes online and does, there’s champions online, then you should be online because you’re going to attract like minded people and you also know what makes you trigger and you can make the consumer trigger. Kosta: Yeah, absolutely. That makes a lot of sense. I’m sorry, go ahead. Listen to the people. Listen to yourself. Okay. Got It. Got It. Um, I was going to say I’m still so shocked at the number of agents who, who still don’t believe in websites, social media, or even having an online presence in general. Uh, what would you say to the agents who are still stuck in that old school mentality and think word of mouth is still the best way to go? Frank: Well, I think you’re confused. There are many people who have a real estate and listens. Not Agents. That’s the difference. Some people have a job. It’s a booming business. Will have a job out of business dealer business or working on their business and they have to use the necessary technology that’s out there today to enhance their business and keep crawling it because, um, you know, that’s what you do. You have to get your hands into your marketing out there. You got to be known, you’ve got to have your property, you have to do your job, which is the market. And I liked that. Kosta: I guess, uh, with the state of the market today. Um, you know, a lot of realtors are telling me how the market has really changed, especially in, especially in the last 12 to 18 months. Um, you know, you’ve been around the block a few times. I’m sure you’ve experienced several economic changes in cycles. What are your thoughts on the current state of the market today and where do you see things heading specifically in Toronto. Frank: While talking to people who. Mom, I mean, they haven’t said anything new that’s always change. If there’s one thing that’s constant in this world has changed. I mean, it was changing before the prices were going up and now we went down. It’s still changing. It’s just less favorable for some people and others. So they’re, they’re talking to you about what’s more favorable, you know, the reality is this, we’re dealing in a commodity, a product that is not something I choose to have is they need shelter. I don’t want very many homeless people and so we’re like something that someone always wants or needs so that the business is always there. The need is always there and it’s just a matter of you being able to attract it in their time of need, whatever that may mean they’re selling or buying or downsizing or upsizing. Kosta: Yeah. Makes Sense. Great. Great insight. Absolutely. Shifting gears a little bit, frank, uh, I’m a numbers guy, so I’m very curious. You’re number one in remax in the world based on dollar volume. What kind of volume is someone looking at it? If they want to reach your level, are you able to share that or if not, provide some sort of range? Frank: Well, I mean, you know, it’s constantly changing. Every year it changes. It’s a relative term, right? So it’s a market. If the sales go down one year, you know, you can be number one with less sales and someone in a market where more sales are going on. So although that is a fantastic award, um, I can tell you this, that we’re constantly crawling and I hadn’t stopped and actually this year we’re actually ahead of last year’s numbers. Oh Wow. Even though the market says that, you know, sales were down over the year and you know, looking at those numbers and everything, everybody’s looking at their numbers and that’s great. But I think that’s the wrong focus. My focus has always been, continues to be. If I can help more people with their real estate goals, buying, selling, investing, etc. I never have to look at numbers again. Kosta: I like that. That makes a lot of sense. Frank: And so the focus is on helping more people all the time. And then you know what I look at back at the numbers, they’ll. Although the numbers, right? So it’s not vice versa. And if you’re going only for numbers, you’re losing focus of what you’re there for is to help people. Kosta: That’s very true. I mean, I think that’s relatable to literally any single business. If you just, you know, make, make your primary focus on the service. I’m catering to your clients, providing the best possible value you can give, then that will translate into the numbers. Right? It goes back to the point of just doing what you love and you know, doing it properly. Frank: So, I mean, one of the people ask me often, what does it cost you to advertise the advertising? I say nothing and they are shocked. I said, why are you shocked? I’m going To be a thing. I go, well, if I spend a dollar and they get a dollar plus back, what did it cost me? Frank: I say that to all the time. I mean, the cost of marketing is so relative. I mean, I could, you know, if I tell someone, you know, I could spend the a million dollars in advertising. Most people aren’t going to be like, oh my god, that’s crazy. But if you’re making 2 million than. No, no, exactly. You’re absolutely right. The question is, what’s it costing you not to advertise your business? Kosta: Yeah, that’s very true. It’s All about perspective. Any, any advice you would give to an agent who, you know, either starting out or has aspirations to, to reach the next level in their business? Any general advice? Frank: Absolutely. I mean, you know, there’s a lot going on in the industry and the business and uh, you know, there’s two ways to learn from your own experience which could take you a long time and it costs you a lot in terms of mistakes and gilbert’s in them, but it all, you can learn from people who already have done it. So if they want to, to really see what’s involved, I mean learn from people who are already in there. I’ll follow them, find them, you know, if they have a team or um, you know, mentor them or coach them, whatever it is. I mean, don’t met the wheel, whatever it is. Frank: You can take at once, you know what it is. I mean they can learn from it and then make it more personal to the bear data to do more in everything works, you know, if you know that work is doing nothing but whatever you do has some effect. And so if you do more of the things you liked to do, you’ll have positive effect in an area that you thrive as opposed to that you despise and don’t like. And you know, you should do more. You want light. What kInd of life is that? You’re not gonna be happy. Kosta: Absolutely. The question I have for you, um, you know, being around a couple of decades now more, uh, how, and you’ve seen a lot of technological changes in your business. How do you see technology changing real estate are impacting how you do business in the next, let’s say five or 10 years? Frank: Everything is done including business real estate on everything that you’re doing at home. I mean, you know, the world is changing and you have to change. Well, it’s getting to be a more advanced that, and I’m not even saying better. I mean there’s ai, artificial intelligence and that I’d be a player and in everything we do. Yes. All I can say is you have to keep an open mind, see where we’re headed and make sure you’re on that train. I missed it. Kosta: I couldn’t agree more personally. I think it’s so important to, to taste and try new things in technology because there’s so many new things coming out and you don’t know what’s gonna work for you, what’s not gonna work for you unless you actually do it. So yeah, you’re right. I think if you’re not up to speed, that train’s going to go right past you. Frank: A lot of people are still stuck in a different decade and not keeping up and that’s why they don’t have the tools of today and that’s why they’re complaining it’s not working anymore because they’re using antiquated methods. Kosta: If you want to come back to that and no problem, come back. Come back to that number two, your top vacation spot. This one should be easy. Did you anywhere recently that you enjoy? Frank: I’ve been to every, you know, a lot of places know that were recently. This year has actually been. I’ve been traveling a lot but not a missing that sunny spot. I’m hoping to go there soon. Kosta: Nice. And um, if you can go back, what do you wish your 20 year old self knew? Frank: Basically that all dreams and all of this is possible. Kosta: Great advice. And uh, do you want to come back to that top real estate or business book? Frank: You know, I read, so all different things. I follow so many people, I don’t know, seven habits. Kosta: Oh yeah. That’s a classic seven habits of highly effective people. Great. Book one of my favorites. And lastly, if someone wanted to reach out or get a hold of you, where’s the best place to find you? Frank: Probably, uh, online at [inaudible] dot com iS probably the easiest, you know, just encourage everybody to never give up on your dreams. Subscribe to Top Agent Podcast on Apple, Google, and Stitcher or take a moment to read the transcript below.By the way, we’re providing exclusive promos to our listeners, visit web4realty.com/topagent and get your first month on us.